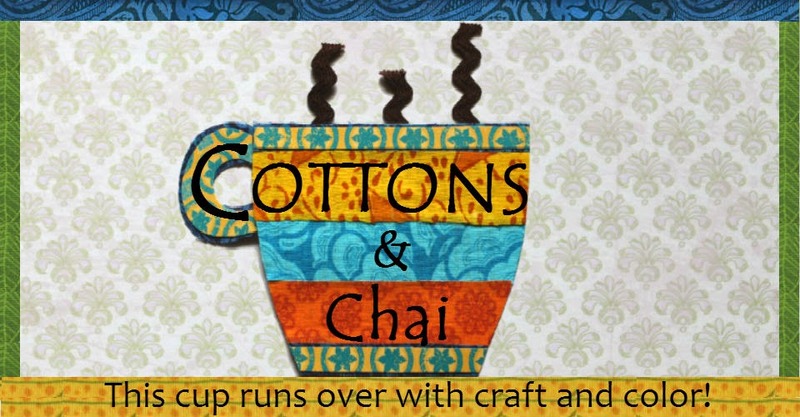 Cottons & Chai: A New Year and A Clean Slate! So, yet another new year has rolled around and here we are again after our brief hiatus. Let me start off by wishing everyone a wonderful, joyful, fabricful and craftful new year! Our trip back home to India the whole of last month has been so full of visits to dear family and friends that the days just flew by and left my little toddler utterly confused about where exactly we were and why we packed our bags and left for yet another destination every few days. But now we're finally at my parents' house where we will stay put for a couple of weeks. I've mentioned before how my Mom and Dad are into handmade and creative stuff. Which is why one of the fun parts of being here is the constant stream of art/craft projects that my parents undertake around the house - and now once more I find myself participating in them. So here's the project I've decided to post about as the very first for the year 2015: Out in the backyard sits this large cement cube that serves as a water storage tank. It used to just be grey and dull until my mom took up its beautification and got a nice coat of terracotta color painted on it a few years ago. 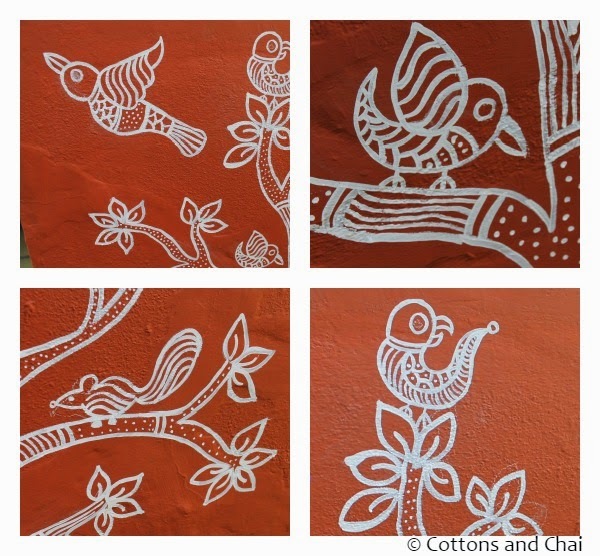 Then the other talented and artistic members of my family - namely my aunt and cousin who are both trained artists painted some incredible warli art on it. 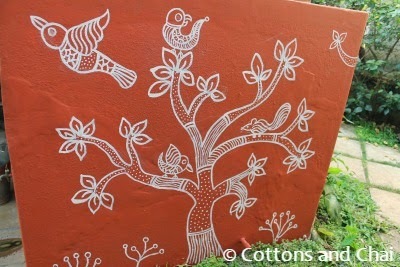 Alas, time went on, the paintings faded and mom reluctantly had to get a fresh coat of paint done last week. 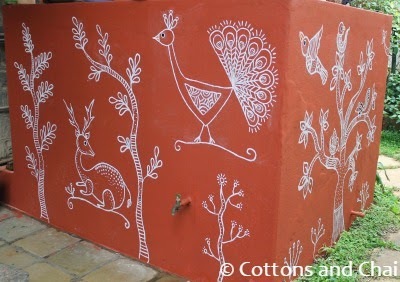 So when I arrived we got busy coming up with a new design to decorate the water tank that was once again a clean slate. Then I went over the drawing with some white oil paint since that's what truly stands out over the vibrant brick red background. 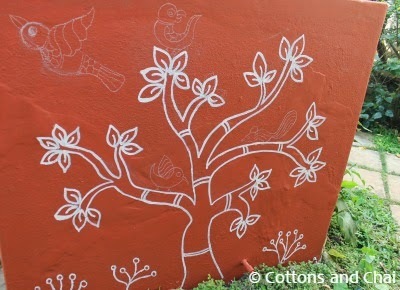 Here's what it looked like once the detailing of the tree was done. It took me an hour and a half to finish this wall. A special mention to my parents who kept the toddler otherwise engaged (with balloons and cars) so that I could paint in peace. Among the woodland creatures we added were a flying bird, a perched bird, a squirrel and a coy parrot. Similarly the other side got a deer and peacock amidst a couple of trees. And I could not resist posting a picture of my parents' delightful garden - complete with a sit-out and hammock. 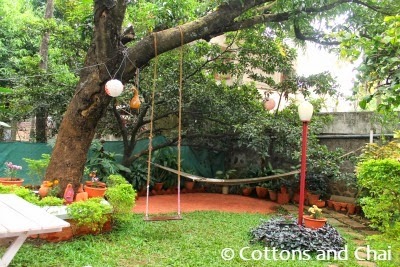 Look closely, you can spot the coir-roped swing hanging from a thick branch of the mango tree. It is the 'grandchild' swing, that's put up only when a little one visits! Needless to say, everyone, young and old falls in love with this little sun-kissed patch of land! I just love this- so darling!! Oh this is so beautiful!!! I love the pictures you drew on the water tank. It adds the 'characters' to this right-out-of-a-storybook garden.